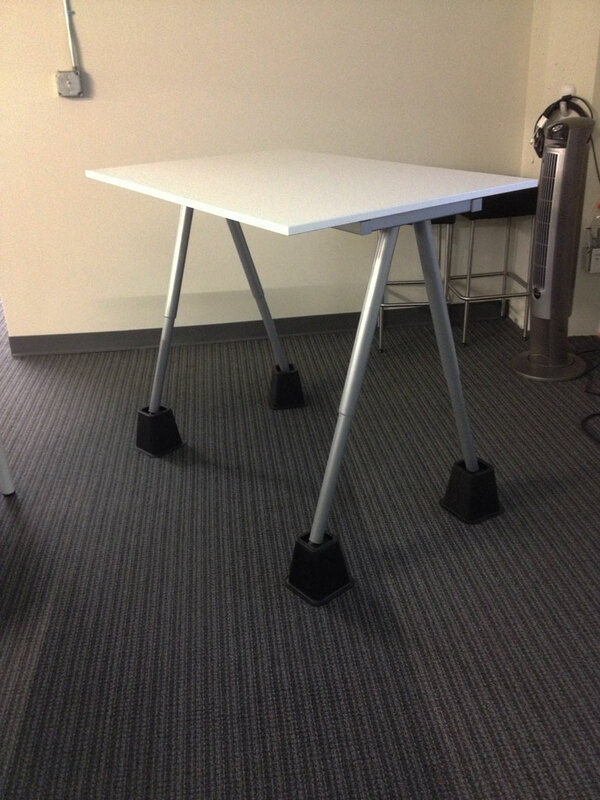 This simple DIY standing desk was found at the Code Fellows campus in Seattle, WA. It’s an instructor desk, so it’s typically used to hold a laptop, beverage, and little else. It stands comfortably at about waist height (to a 5’8″ person, at least). 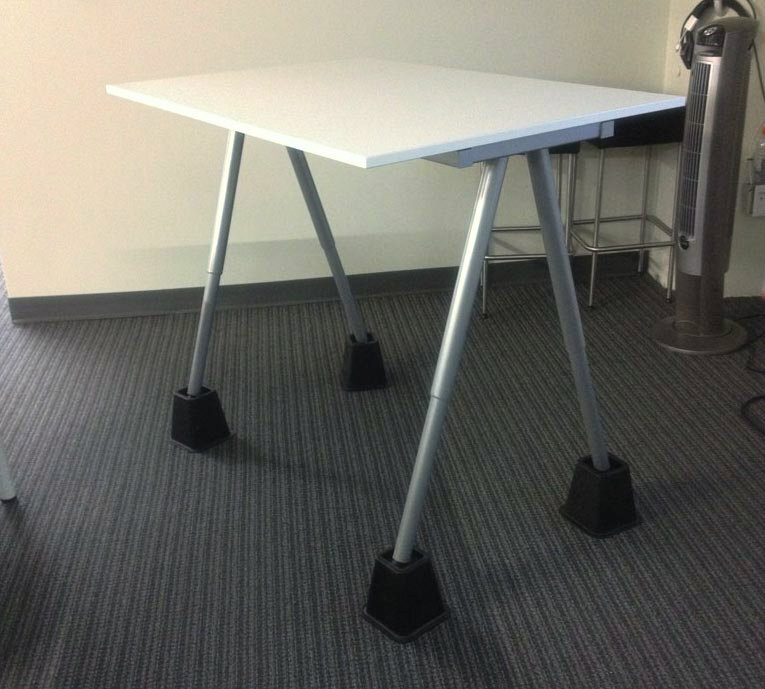 Nice standing desk, Code Fellows! The white desk top and grey legs are from IKEA’s GALANT desk family, shown here with adjustable A-legs resting on top of a set of Simplify plastic bed risers. The foot of the desk fits perfectly into the cup on top of the bed riser and is kept in place by tall, sturdy walls. 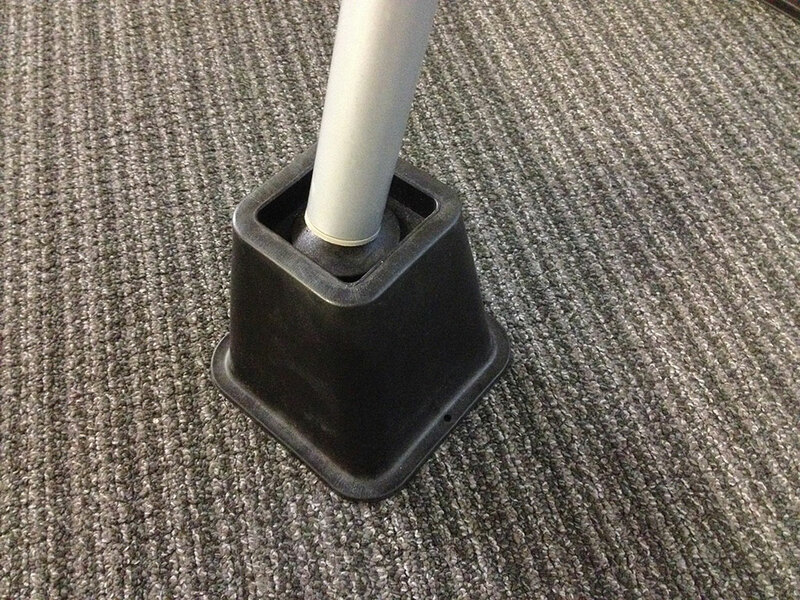 I use these same bed risers in two of my own standing desk setups and they’re rugged as all get out. I’ve always been a fan of IKEA standing desks. IKEA desks are cheap, customizable, and easy to move. If there are any downsides to IKEA desks, it’s that the desktop finish usually chips easily and some of IKEA’s adjustable legs (like these GERTON legs) are downright tedious to twirl until they’re at the right height. These aren’t desks you can adjust on the fly, but they’re sturdy and reliable once set up. PS: The table top might appear sloped in the first photo, but that’s just an illusion caused by lens distortion.